My name is Danielle and I am an Ofsted registered childminder based in Southfields/Wimbledon Park area. I have two children of my own aged 6 and 13 who are both in full time education. 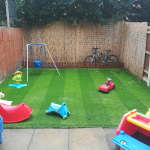 We live in a 3 bed house with a secure back garden not 10 minutes away from Southfields station/town centre. We have a cat named Joy who is extremely chilled and very friendly. My educational background is in Primary Education (teaching) and I have worked/volunteered in nurseries/my own children's school and was a nanny for a family with two girls from they were newborn for over 8years and saw becoming a childminder as an opportunity to still be involved in childcare and be around for my own children while providing a high level of learning, care, support, safeguarding and a positive, healthy environment that with the support of parents/carers will see that child blossom. I will be following the EYFS statutory standards set out by The Department of Education and using the framework set out by Ofsted to cover all areas of learning. A day @Danielle's might involve a day at the park no matter the weather come rain or shine we will be out and about feeding the ducks at the local park (Wimbledon park), looking for books at the local library, at a children's centre or playgroup socialising, singing, dancing or whipping up lunch/cakes in the kitchen, hunting for bugs in the garden or over the common exploring. there will be outings to farms,museums and other places of interest and lots of play be it indoors, outdoors, messy or creative but always having fun. If you have any questions or would like to arrange a visit please don't hesitate to contact me during my working hours. PLEASE SEE ABOVE.. I HAVE WORK WITH CHILDREN IN NURSERIES/SCHOOLS AND WAS A NANNY. As above. I have qualifications in primary education/schools. Please contact me for more information on full time, part time, term time only, emergency childcare or after school care. I am willing to work with families who work shifts but please contact me for more information. Full day = 8.00am until 6:00pm @ £80.00 full time daily rate. Morning half day = 8am until 12:30pm @£8.00. Below are the latest reviews for Danielle. Please note that reviews represent the subjective opinions of other Childcare.co.uk users and not of Childcare.co.uk. Parents must carry out their own checks and references on childcare providers to ensure that they are completely happy before enaging in the use of their services. Danielle's place is set up like a mini nursery but my daughter has never had a meltdown when I've left her there. She happily goes in and plays like she owns the place. She started going there from 7 months and settled in well - Danielle was as good at holding my hand as well as hers when that was happening. Danielle has made her feel secure and cared for in exactly the way I would do myself. She keeps me informed through the day how she's doing with photos and messages. I also get a breakdown of what she's done with her, eaten etc. My daughter does plenty of activities with her and gets to play with other children, especially Danielle's own, who she has come to adore (as well as the cat). When our son's childminder told us she was moving out of London we were worried about finding another one. On meeting Danielle we felt immediately at ease. We are so happy that we chose Danielle. She is kind, caring and fun. Our son has formed a secure attachment with her. Her own children are lovely and Joy her cat is the most chilled out cat we've met! Our son adores Joy and seeing her is often a highlight of his day. Danielle is true to her profile on getting outside each day, trips to museums etc. She gives a good amount of feedback to us about his day and works closely with us to resolve any issues. We would highly recommend Danielle as a childminder. Thank you both so much for this review it is so nice working together with parents who are so in tune with their child and willing to accept advice when to change direction or what's working or not working with their child.